The Second Great War alternative history began as the story of a single ship: the German battle cruiser Derfflinger. In graduate school I built ship models; most of my colleagues did something with their hands as a way of fending off the crazy including actual basket weaving (it didn’t always work). Building a nice resin model of the Iron Dog, I wondered how she might have been modernized for the Second World War. And then I pondered what events could have led to her survival into a new generation. And then I wondered how the empires might have survived the Great War. And that was the genesis of our Nazi-free alternative history story arc. 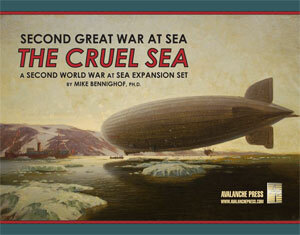 The centerpiece of the Second Great War, in game terms, is The Cruel Sea, a massive expansion set adding Imperial German, Imperial Russian and Republican French ships and planes to Second World War at Sea: Bismarck and Arctic Convoy. And the centerpiece of The Cruel Sea is the Iron Dog, as British sailors supposedly nicknamed her (very few “enemy name” legends are actually true) and her crew gleefully adopted (somehow those nicknames “given by the enemy” always make their way across the lines). The actual Derfflinger was scuttled in Scapa Flow in June 1919 along with her sister Hindenburg and the rest of the High Seas Fleet. In our alternative history she is the oldest German battle cruiser retained by the High Seas Fleet for service in the Second Great War. The Iron Dog, seen in 1918. Derfflinger marked a serious step forward in German battle cruiser design, as the High Seas Fleet finally adopted an arrangement with all main gun turrets along the centerline. She carried eight 305mm (12-inch) guns in four turrets; her predecessor, Seydlitz, had had ten 280mm (11-inch) guns in five turrets, with two of them in inefficient staggered “wing” positions (Grand Admiral Alfred von Tirpitz rejected an all-centerline variant in the interests of speeding construction). Derfflinger would be considerably larger than Seydlitz: 31,200 tons at full load and 210 meters long, compared to 28,500 tons and 200 meters for the older ship. She became the model for most of the German battle cruiser and fast battleship designs that follow, what naval historian Siegfried Breyer called the “perfect battleship” layout: eight heavy guns, with one pair of super-firing twin turrets forward and a similar pair aft. Two sister ships would follow, Lützow and Hindenburg, and two further classes (never completed) built to a nearly-identical design enlarged to accommodate first 350mm (13.8-inch) and then 380mm (15-inch) guns. Derfflinger saw heavy action at both Dogger Bank and Jutland, suffering a single hit at Dogger Bank and 21 heavy shell hits at Jutland, where her survival earned her the nickname “Iron Dog.” She shot up the British battle cruiser Lion at Dogger Bank, which did not sink, and blew up the British battle cruisers Invincible and Queen Mary at Jutland. Lützow would be lost at Jutland; Hindenburg was not fully operational until nearly a year and a half after the battle thanks to shipyard labor shortages. In our Second Great War alternative history, Woodrow Wilson negotiates an end to the Great War in the last days of 1916. Lützow has already gone to the bottom of the North Sea by this point, but Derfflinger and Hindenburg are retained, with Hindenburg assigned to the South Pacific Squadron when war returns in August 1940. 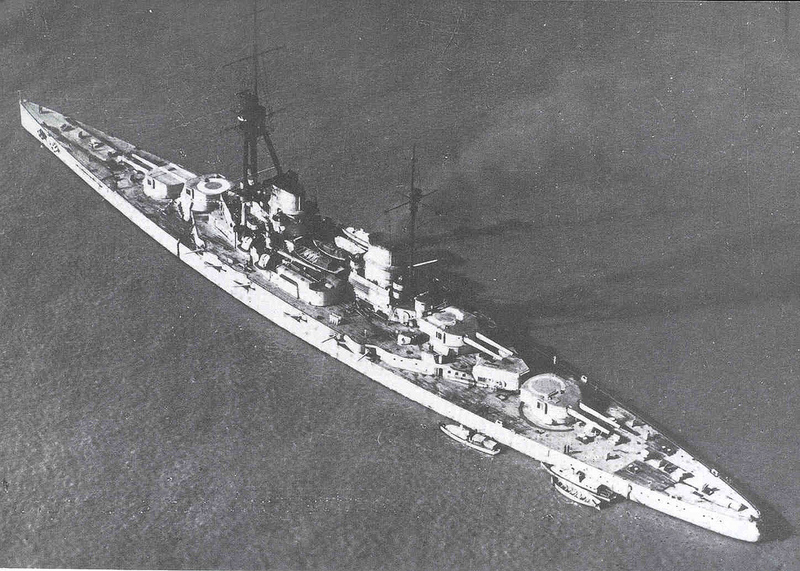 The earlier battle cruisers (von der Tann, Moltke and Seydlitz) have been sold to Turkey, joining the former Goeben, and appear in modernized form in our Sword of the Sea book. In our story line, Derfflinger and Hindenburg are taken into dockyard hands in the early 1930’s for reconstruction. The biggest change is to replace their 14 coal- and eight oil-fired boilers with a new set, all burning oil fuel – an option studied during the design phase, but ultimately rejected in favor of a mixed arrangement. That considerably raises their horsepower output, and should give them a small increase in speed though not enough to rate more than “3” in Second World War at Sea terms. The design team included coal bunkers in the ships’ protection scheme, and their removal requires increases in their belt armor to compensate and more protection applied to her machinery spaces. Her hull-mounted torpedo tubes, useless as offensive weapons and presenting a weak point in her armor, would be removed at the same time. Though Derfflinger was perhaps the best-designed heavy warship of her era, by the 1930’s her deck armor would be inadequate and need to become much thicker. Her main armament would be light by the standards of 1940, but more than sufficient to fight off French or Russian heavy cruisers attempting to attack German convoys on the high seas. In this reality, Imperial Germany retains her vibrant overseas trade through the decades after the Great War, with strong commercial ties to the United States, Brazil and other nations. She depends on American imports of grain and other raw materials (and some finished goods as well), and trade protection is a primary mission of the High Seas Fleet. Derfflinger as rebuilt is well-suited to that mission. Her secondary armament, originally sited in casemates that proved very wet in practice, has been removed and the batteries sealed with armor plate. They’ve been replaced with new weapons placed in turrets on the deck – four 150mm guns in two twin mounts to engage surface targets, and eight high-angle 105mm heavy anti-aircraft guns, in four twin mounts. Like the Kriegsmarine of our own reality, the Imperial Navy does not yet have a dual-purpose secondary weapon in service when the war commences. And like other German capital ships, Derfflinger’s midships design doesn’t provide a lot of space to mount additional weapons on her decks. Like most other large German warships, she carries a helicopter pad on her fantail but not the hangar and repair facilities installed aboard the modern battleships. It’s a useful machine for anti-submarine work and limited recon, and far easier to operate than a seaplane. As the favorite ship in the set – and the reason for the entire line’s existence – Derfflinger sees a great deal of action in The Cruel Sea (and yes, she’s protected by plot armor as well as Krupp face-hardened steel). It’s a battleship game, so all of the big ships get their opportunities on the Tactical Map, but the Iron Dog is set loose a little more often than most.